“The Friars Preachers [i.e. 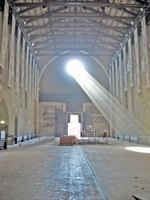 the Dominicans] came to Foligno [in 1285] and began the place [i.e. 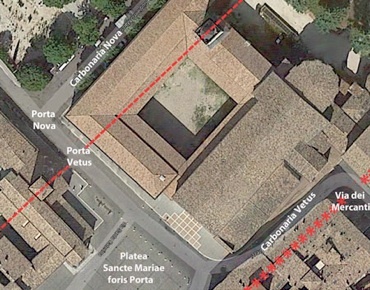 their convent] near the Plateam Sanctae Mariae” (my translation). 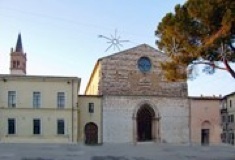 The new convent housed a studium by 1288. The future St Antoninus of Florence was among the Dominicans from Fiesole who took refuge here during period 1409-14, when the events attending the closing years of the papal schism made Fiesole unsafe for them. Pope Pius V transferred the convent to the reformed branch of the Order in 1566. The community was suppressed in 1799, in 1806, in 1848 and then finally and permanently in 1860. ✴After a chequered subsequent history, plans were made to restore the church in 1972, but these came to nothing. The roof collapsed in 1976, which brought matters to a head. The project to convert it into an auditorium began in 1982 and was completed in 1996. ✴The ex-convent housed the Collegio Sgariglia, a school run by the Somaschi Fathers, in the period 1928-71. The history of the construction and decoration of the church in barely documented, but it seems to have taken place over a considerable period of time. ✴The present apse was begun in 1435 and was still not finished in 1474. ✴The campanile was built in 1483. (This campanile is in the photograph on the left. The campanile in the other photograph belongs to the adjacent Orarorio del Crocifisso. 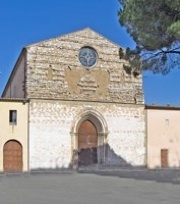 The unfinished façade of the church in Piazza San Domenico is of pink and white stones and contains an ogival door. The huge church has an uncluttered nave that was designed for preaching to large congregations. A large number of altars and funerary monuments were built inside the church from the 16th century, and these obscured most of the earlier votive frescoes. A number of these that were recovered during the recent restoration are described below. The numbers in square brackets below refer to the information boards provided in the auditorium. In this fresco on the counter-facade, angels play authentic musical instruments of the period. The arch through which you enter the auditorium frames this fresco. It depicts Christ fully clothed on the cross, an iconography known as the Volto Santo (Holy Face). A female saint (perhaps St Cecilia, the patron of musicians) stands to the right and a kneeling figure (perhaps the donor) on the left plays a stringed instrument. This depicts the Madonna and Child with SS Peter Martyr, John the Baptist, Catherine of Alexandria and Dominic. This fresco is on the right wall. (Another less well-preserved fresco, perhaps of the same subject and by the same artist, is on the opposite wall). This fresco on the left wall depicts the Madonna and Child with SS Antony Abbot and Catherine of Alexandria. Only a fragment of this fresco on the left wall survives. ✴the Madonna and Child with two saints (perhaps SS Catherine of Alexandria and Dominic). ✴the Mystical Marriage of St Catherine [16 R], not illustrated here. This fresco fragment (15th century) , which seems to be part of a painting of a statue of St Sebastian in a tabernacle, is attributed (not particularly reliably) to the young Nicolò di Liberatore, l' Alunno. This fresco (15th century) of the Madonna di Loreto is attributed to Bartolomeo di Tommaso. The fine artist who painted this fresco probably came from Orvieto. Unfortunately, it was subsequently overpainted (see 7L above), and only a few fragments survive. The largest of these, in the lower part of the fresco, depicts part of a fleeing friar. This full-length figure (of which a detail is illustrated here) is under the entrance arch (on the right as you enter). The artist responsible, who probably came from Orvieto, probably also painted the unidentifiable figure opposite. This damaged fresco is close to one on the counter-façade (see ?? above) that depicts the dormition and coronation of the Virgin, aspects of dogma in which St Thomas specialised. This fresco fragment depicts what could be the head of St Martin. This detached fresco, which is attributed to Pierantonio Mezzastris, depicts the Madonna and Child with SS John the Baptist and Dominic and musical angels. This damaged detached fresco, which is attributed to Pierantonio Mezzastris, came from the chapel to the right of the presbytery. It depicts the Crucifixion with the Virgin and SS John the Evangelist, Peter, Paul and the kneeling Mary Magdalene. The sinopie survives in the original location; the figures of St Mary Magdalene and of the four angels in the fresco do not appear in it, which suggests that they were later additions. This damaged detached fresco of the head of an angel in a tondo came from the chapel to the right of the presbytery. It was probably on the side of an entrance arch, opposite another of the Virgin Annunciate, and seems to have been part of a composition that included the Crucifixion above. The fresco is variously to Pierantonio Mezzastris or Benozzo Gozzoli: it is almost certainly based on the cartoon that was used for Benozzo’s fresco in Narni. It has to be said, however, that there is no documentary evidence that Benozzo was ever in Foligno. This fresco came from the presbytery. ✴it also depicts the cupola of the Duomo, which was completed in 1602. ✴St Antony [of Padua ?] and scenes from his life. Emanuela Cecconelli (referenced below, at pp. 362-6) associated the former with a documented but now lost panel (1602) by il Fantino from the Cappella del Rosario of San Domenico, which depicted the Madonna of the Rosary and SS Dominic and Catherine of Alexandria. She suggested that this lost panel of the Madonna of the Rosary and the surviving panel of a view of Foligno originally formed a single work in the Cappella del Rosario.